Salicru’s DC power-S energy systems feature the following components: DC-S rectifier modules, subracks, a control and monitoring system, a communications module and a DC distribution unit, all situated in a closed cabinet with the possibility of including batteries. DC power-S system rectifier modules are available in power ratings of 1000, 2000 and 2700 W and output voltages of 24, 48, 110 and 125 Vdc. 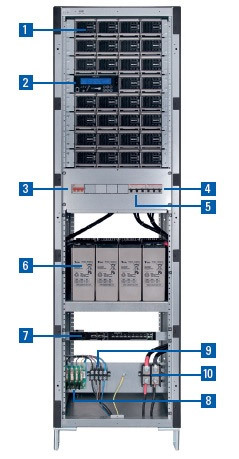 Its modular design enables up to 4 modules to be installed in a 19” 2U subrack, achieving very high power density. The control and monitoring system manages the entire system: input and output measurements, battery charging currents, control of priority and non-priority loads and communication channels with the outside. The maximum number of rectifiers controlled by a control system is 3 , enabling systems to achieve power ratings of up to 81 kW with N+n redundant configuration options. The basic version of the communications module has: three programmable relays, a battery temperature sensor and an RS-232/485 channel. Extended version features a slot for an Ethernet/SNMP adapter, an NiCd electrolyte level detection input and six additional relays. Salicru’s DC power-S energy systems provide a high-level power supply to always critical telecommunications systems,ensuring excellent operation without unexpected outages. Because of its modular nature, it can also be expanded according to needs, thereby optimising the investment. Typical applications include: fixed and mobile communications networks, broadband access networks and data and telecommunications networks. Maximum power per system up to 81 kW. Flexible, scalable and N+n redundant systems, configurable for current demand and future expansion. 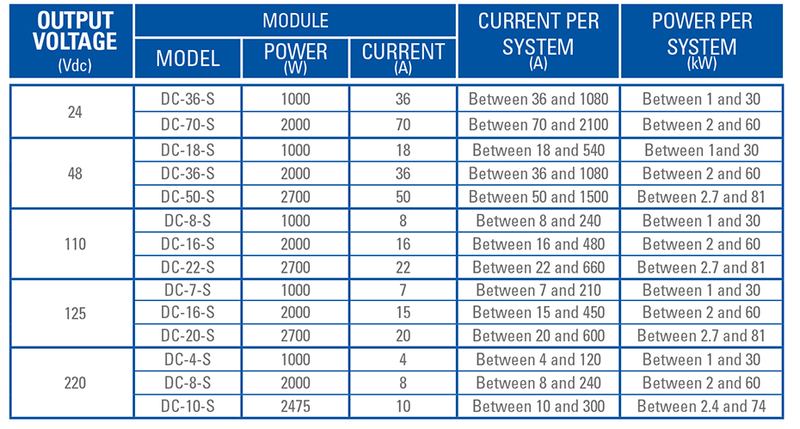 High power density in the modules, up to 27 W/in3. High efficiency, up to 95% even with low load. Option of single or three-phase power supply. DC systems with output voltages of 24, 48, 110, 125 or 220 Vdc. Wide operating temperature range from -20º C to +55º C.
Wide input voltage range from 90 Vac to 290 Vac with power derating. Input power factor 1 for better performance. Modular design of the rectifiers and control system. Output current sharing between rectifiers. Front access for easy installation and maintenance. Hot-swap and hot-plug functions with automatic adjustment for module connection/disconnection. LLVD and BLVD - disconnection of non-priority loads and for low battery voltage. Full local control and monitoring system with LCD backlit (4x40 characters). Communication unit for remote monitoring. Smart-mode to maximise MTBF (Mean Time Between Failures). RS-232 or RS-485 serial ports. MODBUS communications protocol. Programmable (x7) dry contact interface. (1) Only for extended version. Positive, negative or isolated output voltages. 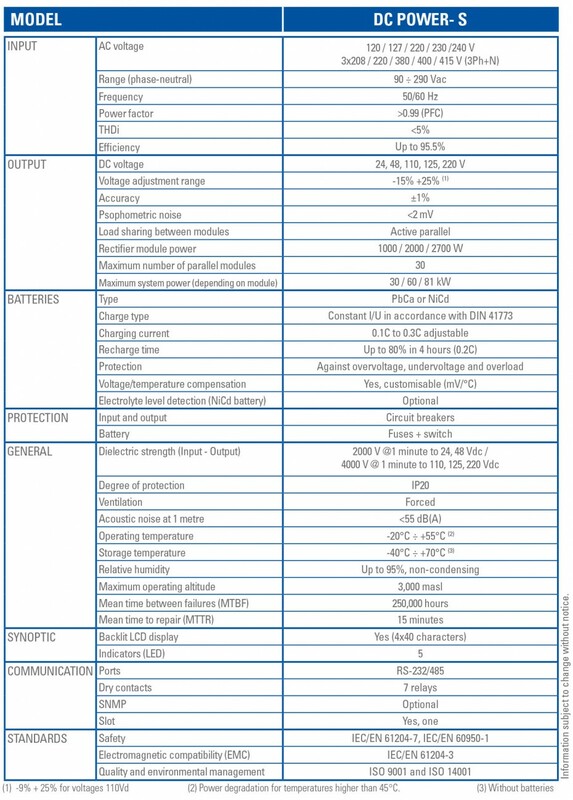 Sealed or open PbCa batteries, NiCd, etc. Other degrees of IP protection. Set of diodes used to drop the votlage and ensure that the DC output voltage doesn’t exceed the limits required by the loads. An application that can be installed on tablets with the Android operating system to establish remote communication through a Bluetooth connection. This enables the equipment’s communication functions to be extended by increasing the potential-free contacts from 3 to 9 and adding a digital input for electrolyte level detection (only for open lead or NiCd batteries). Connection of one of the two DC output voltage poles to earth. DC negative pole connected to earth, positive output and positive pole connected to earth, negative output. Adaptation of the cabinet’s protection against solid particles and water to the different degrees indicated in standard EN 60529. The equipment enables charging of different types of battery and adjustment of each charging parameter, in particular, for each type of battery.